Graduate student Emilie Nazzaro saw her father's obsession with Marduk's Tablet lead to his betrayal and murder. Now, she's been charged with deciphering the symbols on this centuries-old piece of clay, which legend says contains omens with healing powers. On a harrowing journey through Israel and into ancient Babylon, she tries to uncover the secrets surrounding her father's death - while fighting to stay alive herself. Along the way, she must decide if she will find answers to her own spiritual questions in the ancient mythologies of reincarnation or in the pages of Scripture - and the hands of God Himself. 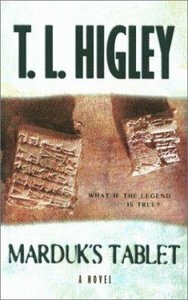 Her father was obsessed with a Babylonian clay tablet believed to hold mysterious healing powers---now he's dead. Will the arcane symbols on the artifact lead Emilie Nazzaro to her father's murderer? Follow her harrowing journey as she tracks down the killer and seeks an answer to her own spiritual quest: Is her eternal fate found in the mythology of reincarnation or in God's Word? Graduate student Emilie Nazzaro has been charged with deciphering symbols on an ancient piece of clay, believed to have healing powers-but danger awaits her. "T.L. Higley " holds a degree in English Literature and has written three previous novels and more than fifty drama productions for church ministry.? She is especially passionate about "breaking down emotional and philosophical barriers that people have put up between themselves and Christ."